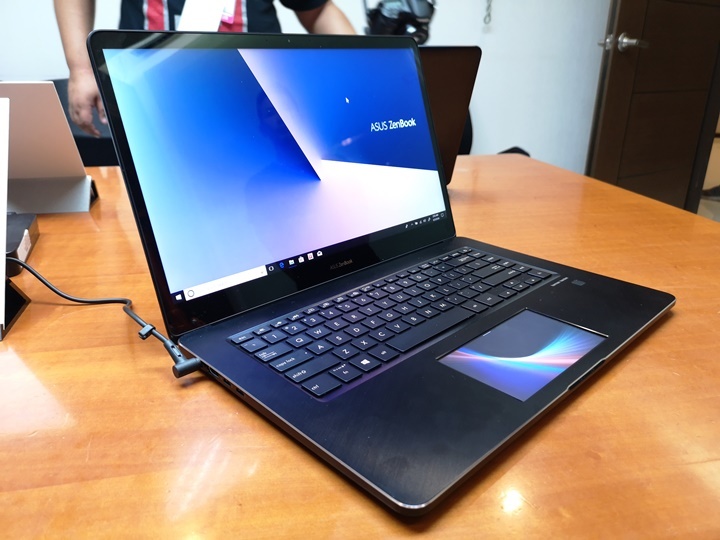 Back in Computex 2018, ASUS made waves with a couple of very unique laptops. 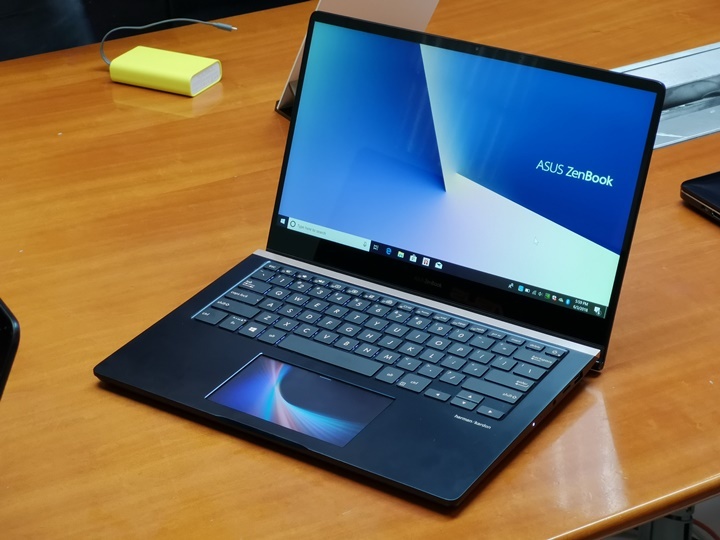 The all-new ASUS ZenBook Pro 14 and 15 models introduced a quirky, but very functional input system with the ScreenPad, a touch display built right into the laptops’ trackpads. Today, we will be taking a look at the 15-inch model, or the UX580GE. Its internals definitely pack a lot of oomph, and the ScreenPad is really cool. 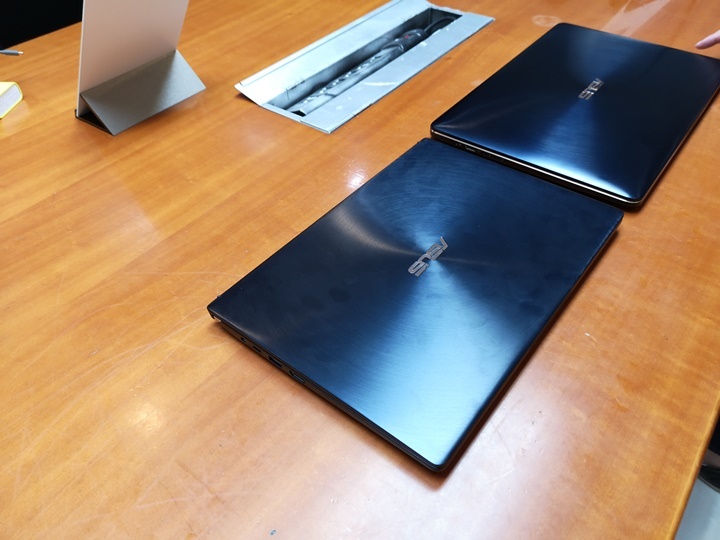 The ZenBook Pro 15 UX580GE’s overall design sticks true to ASUS’ usual laptop design language. 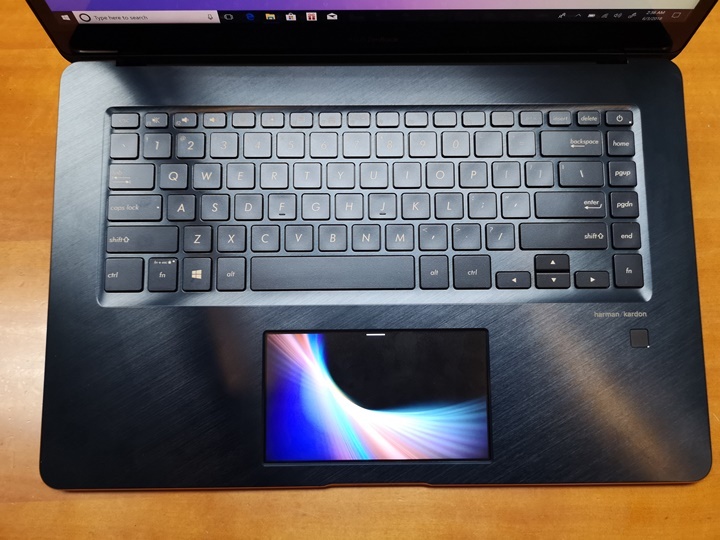 It’s got that classic deep blue color, the subtle ripples and silver ASUS logo on the back cover, and the look of the keys. This is a 15-inch laptop that packs an Intel Core i9 processor (or Core i7 for the Philippines) and a GTX 1050Ti, so naturally, it’s a big boy. It’s very hefty and very solid since it’s designed to be a creative workhorse. This can be attributed to the use of more aluminum than plastic. Up front is the 15.6-inch LED-backlit display that has fairly decent bezel size. They’re not the thinnest we’ve seen, but are within proportion. Adjacent to the display, on the bottom half, is the keyboard, ScreenPad, and fingerprint scanner. The keyboard uses a sort of TKL (tenkeyless) layout with the page navigation keys and power button on the rightmost side. We can easily forgive the lack of a number pad for two reasons — First, it means that the rest of the keys are full-sized and well-spaced out, and the entire keyboard is in the middle of the chassis for maximum comfort. Second, the ScreenPad can be used as a calculator anyway, which is half the use of a numpad. The keyboard is very nice to type on not just because of the size of the keys and spacing, but also because of the generous 1.5mm key travel. Now, the fun part. The ScreenPad is actually a 5.5-inch FHD Super IPS+ display that has a nice matte finish. It’s smooth and lets your fingers glide with ease, whether you’re actually using it as a trackpad or swiping to use the apps. For I/O, we have DC/in, HDMI, and two Thunderbolt 3 ports on the left side. The right side on the other hand, has two USB 3.1 Gen 2 Type A ports, a combo audio jack, and microSD card slot. This device being a content creation machine, it’s strange that we have a microSD slot instead of a full-size one. Overall, we are very impressed with the UX580GE’s design and built quality, as it complements the raw power it brings. This review itself is unique as we actually have two displays to talk about. Let’s begin with the main one, though. 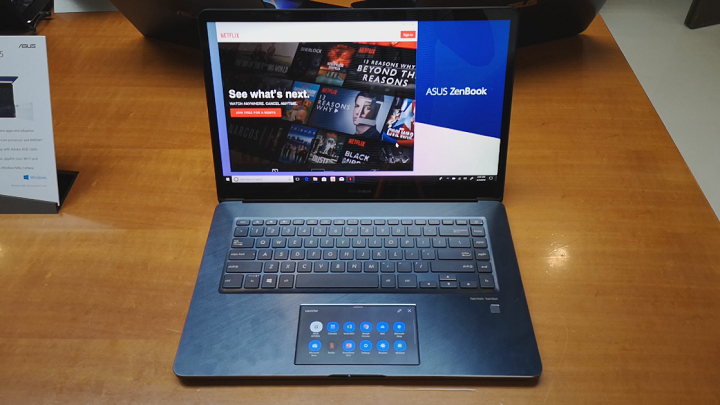 The Zenbook Pro 15 UX580GE we have carries a 15.6-inch UHD (3840 x 2160) LED-backlit touch display that boasts 178-degree viewing angles, 100% Adobe RGB color gamut, PANTONE validation. These factors really hold true as their weight, as the device has a gorgeous display, and is great for whatever you throw at it. Whether it’s photo/video editing, graphically beautiful games, or just watching videos, you will have a stellar experience. The wide color gamut and fancy PANTONE validation ensure creative professionals that the display can handle their work. Brightness is also very good, so you won’t have a problem taking this machine to a cafe. The ScreenPad is awesome as well, and we were surprised it actually has a resolution of 1080p. At 5.5-inches, it’s like having a smartphone display for a touchpad. It’s bright, sharp, and colors are good due to it being an IPS display. The touch functionality is very responsive, as well. For audio, like most good ASUS laptops, this one carries Harman Kardon certified ASUS SonicMaster stereo speakers. 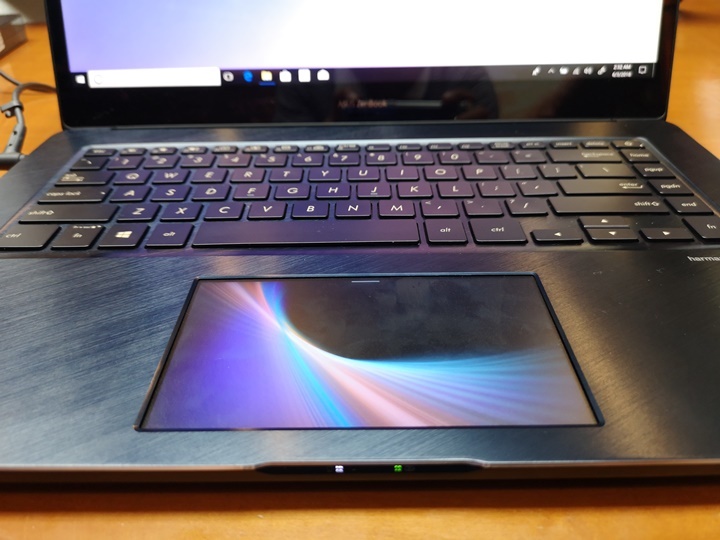 The ZenBook Pro 15 UX580GE geared towards creatives, but is also a powerful multimedia machine in its own right, with big thanks to its great speakers. They’re very loud at maximum volume, and quality doesn’t really drop much at that point. Highs and mids are crisp and clear with lows enough to slightly thump a light table. 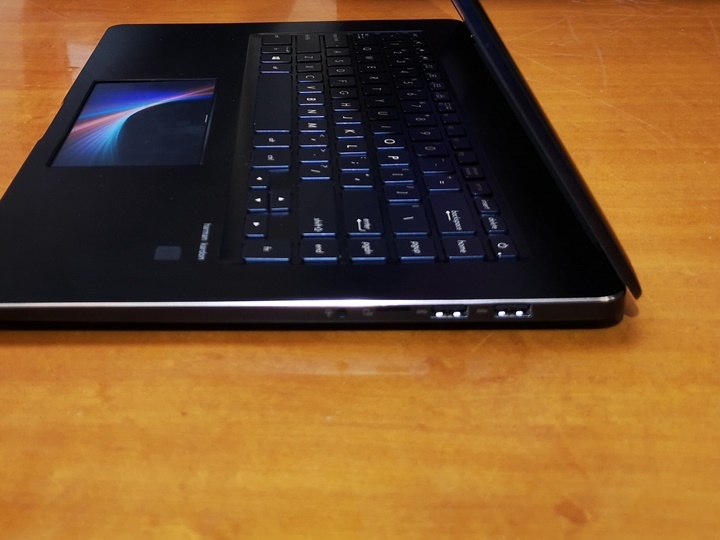 The ZenBook Pro UX580GE comes with either regular Windows 10 or Windows 10 Pro (64-bit). You will find the usual Mail, Weather, News, and Skype apps, to name a few. Surprisingly, there isn’t a lot of proprietary ASUS bloatware pre-installed. In fact, all we get is ASUS Giftbox, ASUS Sync, ASUS Battery Health Charging, ASUS Splendid, and ASUS Eye Care. The included software functionality at this time is actually pretty decent. 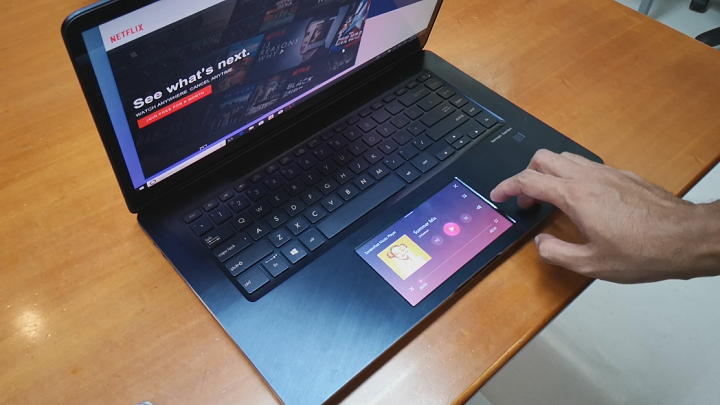 You can use it as a normal touchpad (screen will be off), as an extension of your main display, as a separate desktop, or using one of the included apps. These include a settings toolbar, calculator, numpad, calendar, and video player. By far though, our favorite is Spotify control. We think the ScreenPad, overall, is a better secondary screen implementation than Apple’s Touch Bar. The unit we used for this review is the highest specced variant, which packs an Intel Core i9-8950HK processor, NVIDIA GTX 1050 Ti 4G, 16GB of DDR4 2400MHz RAM, and a 1TB PCIe SSD. As expected, it’s a beast of a performer. It’s silky smooth in every aspect of basic operation and is well-suited for both creative work and graphically heavy AAA games. 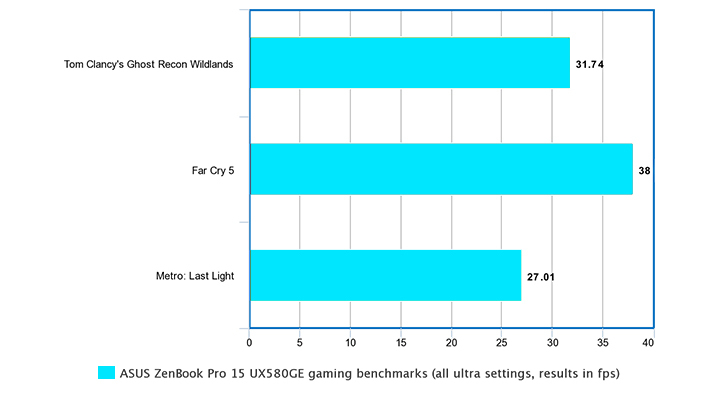 At the highest possible settings, heavy AAA games are somewhat playable at 1080p, at around 30fps, but we recommend bumping down the settings for higher frame rates. In our synthetic benchmark tests, the device also performed well, getting decent scores in Fire Strike and Time Spy. In the Blender BMW rendering benchmark, we were able to get a time of 1 minute and 54 seconds. A powerful desktop will be able to achieve less than a minute, but this score is still great, especially for a laptop. 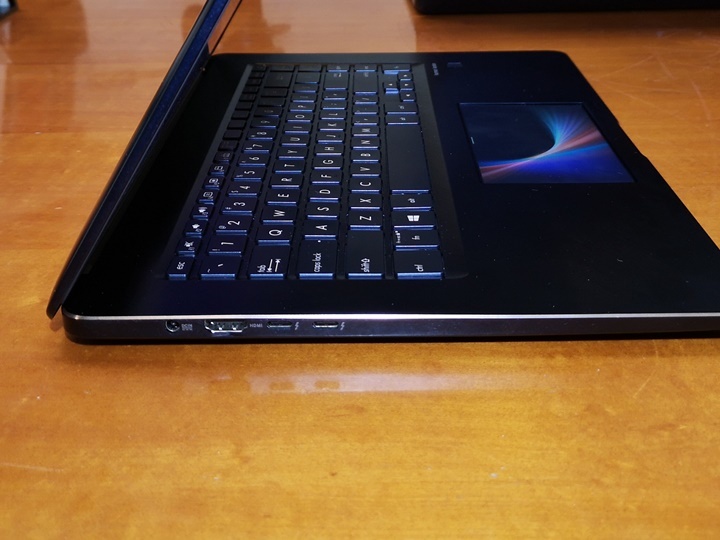 The Zenbook Pro 15 UX580GE is powered by a 71Wh 8-cell Li-Po battery, which is sub-par for a modern ultrabook. We ran our video loop test, which consists of a 1080p MP4 video played in a loop at 50% brightness and 50% volume. The ScreenPad was also on for this, at 50% brightness. The test yielded 8 hours of continuous playback, which is actually pretty good. Charging uses a bulky 150W power brick and takes about two hours from 0% to 100%. 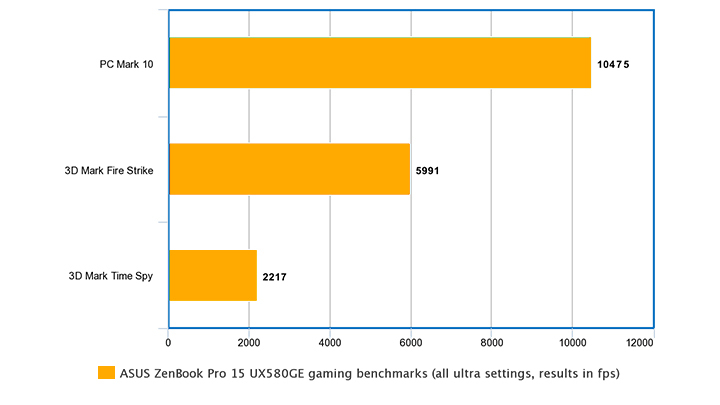 The ASUS ZenBook Pro 15 UX580GE is a formidable creativity powerhouse in the ultrabook market. It’s got an amazing display, powerful internals, great sounding speakers, and a ScreenPad that totally beats out Apple’s Touch Bar in our opinion. It’s a unique machine that will satisfy the needs of someone who both creates and games. Price is fairly steep but fair. Although take note that only the Core i7 model is currently available in the Philippines. 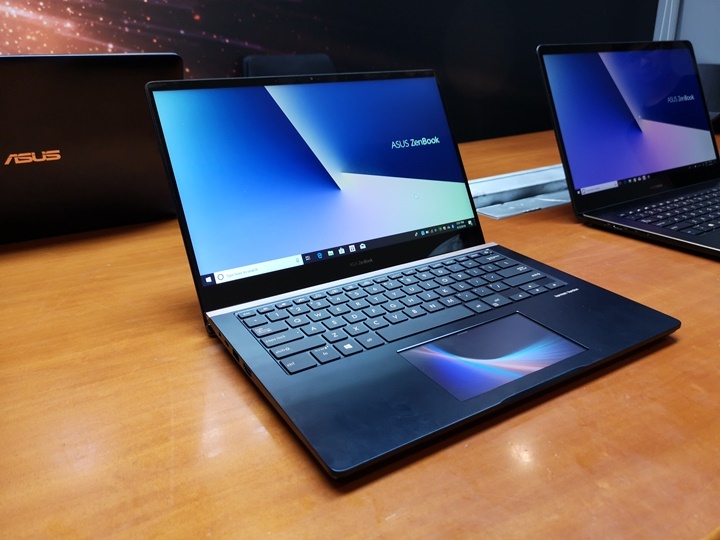 It comes in three variants — 4K UHD with 16GB RAM and 1TB PCIe SSD (Php 134,995/$2,524), Full HD with 16GB RAM and 1TB PCIe SSD (Php 119,995/$2,244), and a Full HD with 16GB RAM and 512GB PCIe SSD (Php 104,995/$1,963).